A Diamond Select Toys Release! It's time for a holiday! 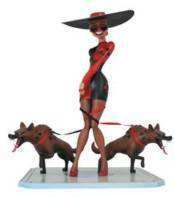 Harley Quinn debuted 25 years ago in an episode of Batman: The Animated Series, and for this new Premier Collection statue, she's taking a day off with her two pet hyenas! Based on the title card for 'Harley's Holiday,' this approximately 12-inch resin statue was meticulously sculpted by the masterful Clayburn Moore, and features detailed paint work. Limited to only 3,000 pieces, it comes packaged in a hand-numbered box with a certificate of authenticity.